Prop. 127 would increase the amount of electricity Arizona’s utilities must get from renewable sources to 50 percent by 2030. Despite the bluster and fury of campaign ads, a close examination of studies shows that Proposition 127, The Clean Energy for a Healthy Arizona ballot initiative, would have only a modest impact on electricity bills. “Climate change needs to be addressed, the question is whether to do so through amending the state’s Constitution or via the Arizona Corporation Commission. Based on climate research, by 2030 the state may lose about one-sixth of its economic growth because of the more extreme heat caused by climate change and by 2090 the state’s economy may begin to contract,” noted Dr. Dave Wells, research director with the Grand Canyon Institute (GCI) and author of the policy paper Impact of 50% Renewal Portfolio Standard Under Prop. 127. GCI, a nonpartisan think tank, has not taken a position on Prop. 127 and conducted its analysis without payment from any organizations or people. Prop. 127 would increase the amount of electricity Arizona’s utilities must get from renewable sources to 50 percent by 2030. Utilities like APS have already achieved the current standard of utilizing 15 percent renewable energy by 2025. The initiative defines renewable energy as solar, wind, biomass, certain hydropower, geothermal, and landfill gas energies. It excludes current nuclear and hydro capacities. Who do you believe: Utility lies or 480,000 petition signers? APS, the proposition’s main opponent, claims that if approved Prop. 127 will increase electricity bills by at least $1,000 annually and that the Palo Verde Nuclear Generating Station will likely be closed. The Clean Energy for a Healthy Arizona Committee, the proposition’s backer, claims that electricity bills will decrease slightly and Palo Verde will stay open. Whom to believe? “APS has suggested they will have to close or sell their stake in Palo Verde if the proposition passes, which from a climate change mitigation perspective, would be a significant negative result of the initiative,” according to Wells. GCI’s analysis carefully reviewed two studies that used APS data inputs, one from ASU’s Seidman Research Institute in March and more recently one from Arizona’s Residential Utility Consumer Office (RUCO). Both studies arrived at similar conclusions according to GCI, with bills in today’s dollars going up by about $200 annually by 2030. By contrast, the Yes campaign’s analysis suggests bills go down by $30 in the same timeframe. GCI could not assess the Yes campaign’s claim due to limited details on that result. “There are limitations with all studies, but the general connection that can be made is that any impact on electricity rates, whether an increase or small decrease, will be modest compared to APS’ claim that they will go up at least $1,000 per year,” according to Wells. In August, the Seidman Research Institute did put out a memo to APS saying that bills would rise 117 percent or $1,900 per year. GCI’s analysis thoroughly debunks this claim. “The memo presents information that simply calculates a rate based on numbers provided by APS,” Wells said. In Arizona, the alternative option would be to seek change through the Arizona Corporation Commission. Commissioner Andy Tobin already has a proposal to reach 80 percent clean energy by 2050, including nuclear and conservation, which is supported by utilities. “If Arizona plans to make a proportional effort to mitigate the impact of climate change, the current portfolio standard needs to be dramatically upgraded. The question for Arizona voters is whether Prop. 127 is a desirable mechanism to do so,” said Wells. Two GCI board members have taken public positions in favor Prop. 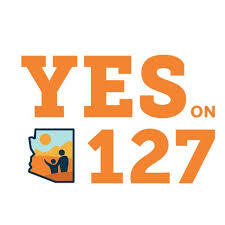 127 and one is co-chairing the Yes campaign. Both have recused themselves from contributing to or reviewing this policy paper. Click here (for pdf version) of GCI’s policy paper. Previous articleFLYING SOLO? McSally ONLY Major Senate Candidate With No Employees, Paying No Payroll Taxes; IRS/State Violation? It also appears that APS has been deliberately concentrating its investments into coal over the past years when other utilities have been getting rid of their coal plant assets. APS has been hand-cuffing Arizonans into depending on the Four Corners coal burning energy plant and has now convinced the Navajo Nation into investing in the facility, linking their financial future to the cost-ridden, aging plant, too. Between buying up assets that other utilities are happy to get off their hands, electing state legislators and ACC commissioners guarenteed to back APS’s agenda to have Arizona consumers foot the bill for repairs and environmental equipment needed by the plant, APS has created a nice, little “company store” for itself. Arizonans have no choice but to depend on APS for the energy we need, while at the same time, APS is bilking consumers and paying itself and its shareholders profits out of proportion to its size. Of course APS needs to block any initiative that would break its parasitic hold on consumers and decrease its profits before it has reached the projected maximum investment returns for its shareholders.